The reddish pinwheel in this image is data from the VISIR instrument on ESO’s Very Large Telescope (VLT), and shows the spectacular plumes of dust surrounding Apep. 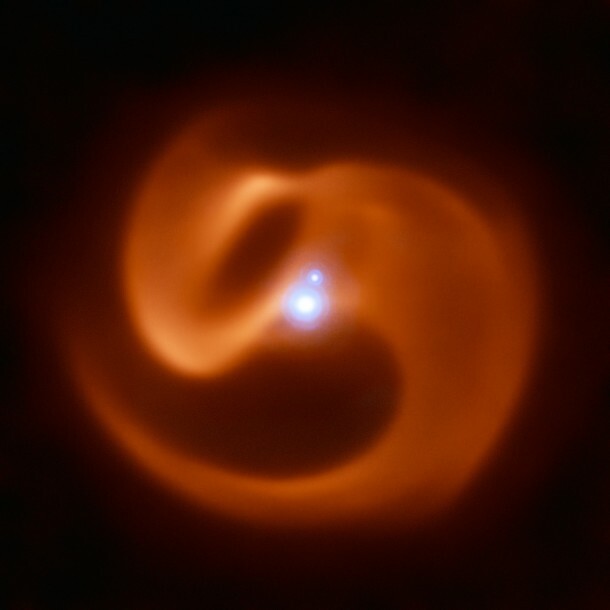 The blue sources at the centre of the image are a triple star system — which consists of a binary star system and a companion single star bound together by gravity. Though only two star-like objects are visible in the image, the lower source is in fact an unresolved binary Wolf-Rayet star. The triple star system was captured by the NACOadaptive optics instrument on the VLT. Credit: ESO/Callingham et al. “This is the first such system to be discovered in our own galaxy,” explains Joseph Callingham of the Netherlands Institute for Radio Astronomy (ASTRON), lead author of the study reporting this system. “We never expected to find such a system in our own backyard” . Callingham, now at the Netherlands Institute for Radio Astronomy (ASTRON), did part of this research while at the University of Sydney working with research team leader Peter Tuthill. In addition to observations from ESO telescopes, the team also used the Anglo-Australian Telescope at Siding Spring Observatory, Australia.